The cookware in our kitchen had been kind of embarrassing. 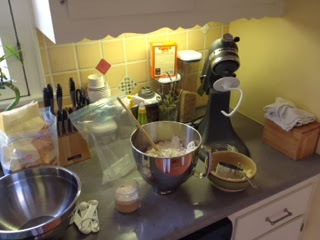 Over the years, I've been doing a lot of cooking in "The Ukrainian"'s old basic pots (see this post if you really want to know) and some hand-me-downs from a friend who moved on to better things (example in this post). Since we already had all this stuff, we didn't register for new cookware when got married. I mean, why ask for what you already have, right? Until I realized that I was practically wearing a hole into some of the pot bottoms, and everything would stick and cook unevenly. I had toyed around with the idea of a dutch oven for years. 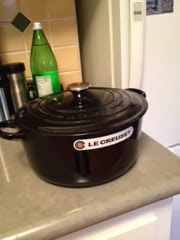 My foodie friend had bought a small one at Crate & Barrel for less than $100 with what he calls good results. At the time, I figured there was no reason to cook with something that heavy and that expensive. Then, I won a Le Creuset baking dish on a blog. I didn't use said dish for close to a year (because I still had my trusty cheap ones! ), but once I started to use it more after I moved and unearthed it, I realized its quality. Fast forward to Carlsbad Marathon weekend -- we were at the outlet mall, and they were clearing out a bunch of Le Cruset stuff due to... color! That's right. I could pass up a green dutch oven if it came at a low price. So this 5.5 quart guy came home with us, and hopefully will grow old with us and be passed down to the next generation. I was afraid to cook in it, as there were some care rules I had never heard of before. No heating it up higher than a medium temperature. No quick temperature changes. No dry cooking. You get the point. Maybe this is why I ruin everything I touch. 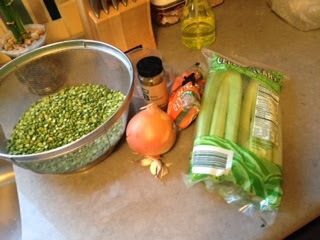 We decided that the maiden voyage of this piece of cookware should be split pea soup. We have been to this place called Split Pea Andersen's several times, seemingly each time we leave town to go up north, though I haven't really blogged about it. On a recent visit, I noticed they had their recipe on the back of a sack of split peas. It really didn't seem like rocket science, so I gathered some stuff I already had and went for it. So here's the final result. I didn't get intermediary photos (explanation below), but I will say that A) this really did taste authentic and B) dutch ovens take a long time to heat up, especially if you can't crank the temperature and decide you want to double the recipe. My soup is a bit chunkier than the real version, as I was conservative with the immersion blender and also with the amount of water that I felt could safely fit in the pot. I'm pretty sure I didn't need a dutch oven to get this result, but since it's larger than anything else we have, it DID make a lot of soup! 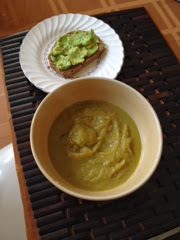 Eaten with some of my homemade bread and another avocado from the tree (why do they all have to ripen at once? ), squeeze of lemon, and pepper flakes. 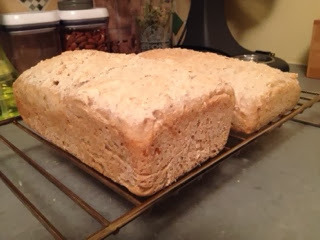 Cauliflower bread. 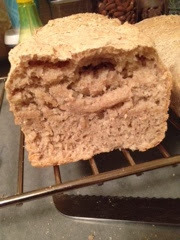 This cross-section picture is crappy -- I later ate a slice from the middle of the loaf, which looked WAY better and even. Also, teriyaki sauce/rice/veggies/chicken. 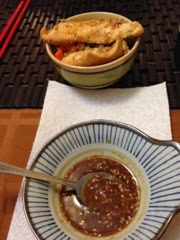 I can't believe how simple it is to make teriyaki sauce. So far, I don't know the full extent of what one could do with a dutch oven and whether it was worth the splurge, but I do look forward to more cooking experiments using it (for example, dutch oven bread!). I definitely want to work on improving my cooking skills because I keep getting disappointed by restaurants and am a homebody who still wants to eat different types of food.